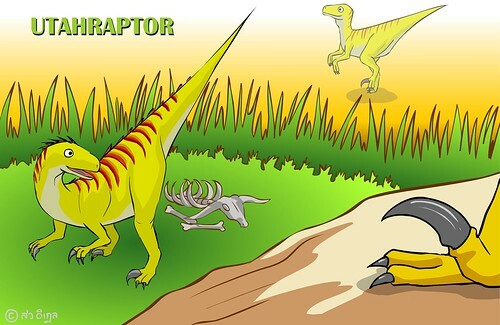 Utahraptor is the most favorite dinosaur for the artist who makes this website. It got the perfect body shape and dangerous claws on both hands and both feet. These claws show that Utahraptor could kill the bigger dinosaur by climbing on its body, and its body will get bloody. Utahraptor also had strong hint legs which could run very fast. Its long tail was used to balance its head while running. Roll mouse over the small dinosaur, you will see it walks. Roll mouse over the claw dinosaur, you will see it moves.